Here is a boat moving in for the Show....it is that time of year again. The Maine Boatbuilders Show started Fri and tomorrow is day 3 already. This year has been a good show so far and tomorrow should bring even more interest. People are really intrigued by what I have to offer, a couple dozen truly unique boat kit designs most of which are available only through CCBB! This is the first time a Goat Island Skiff has been displayed at a US boat show as far as I can tell and people are loving the boat. My boat is still unpainted, but there are always a few boats at this show that are in progress, which makes it a lower key boat show. 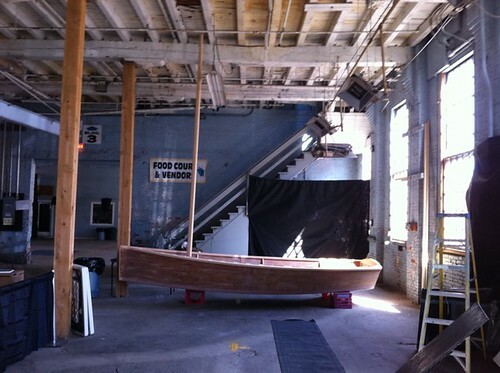 The philosophy behind this show is that it is a boatbuilders show. People talk to the boatbuilders not reps and, in the case of an unfinished boat, get a rare glimpse into the workings of a boatbuilder, work that is normally inside a shop until it is all painted. 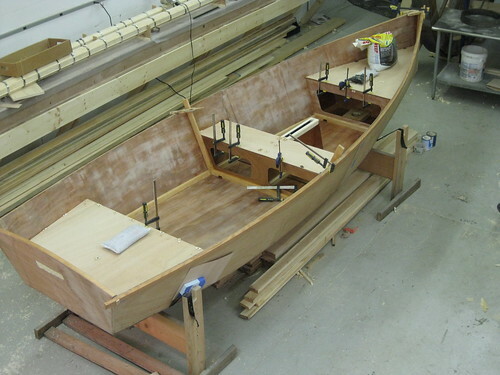 Drake is getting built in the shop to test the fitting of the kit before they get shipped off to first customers in WA and PA. Kent Fosnes in WA will be exhibiting Drake next year at the Port Townsend Wooden Boat Festival. All kits are tested more than once to ensure everything goes together properly. Many of these CAD drawn, computer numerically controlled (CNC) parts are cut to the thousandth of an inch! Accuracy and precision are among a number of value added benefits to a kit. More info about CNC cutting and those benefits is forthcoming. The first GIS Yawl doing the Texas 200 endurance event. After the busy summer, I am back in action. Just finished are some plans for my GIS yawl that I am making available for free on my GIS page. Enjoy looking at the yawl and the other tidbits of info I include. Our GIS will be going together in October. The Small Reach Regatta was the next stop in my busy summer. The SRR is a gathering of 70 sail-and-oar boats, this year, at Lamoine State Park and put on by the Downeast Chapter of the Traditional Small Craft Association. Irowed and sailed (downwind) his rowboat design Drake and consistently finished in the front of the fleet (but of course it wasn’t a race!). The event was three days. Day 1 was a short windy upwind row and downwind return to a classic small Maine coast island. Every day features an interesting lunch stop, a wonderful opportunity to rest and to look at others' boats. Moreover, I see it as a learning experience to talk to the builders and owners of the boats. I learn something new from every one of the boats. For me, the SRR is about the finest form of professional development I can get. On the downwind return to camp, a small squall came through and the force overcame my mast step..."WHAM! "...I heard the snap and the boat lurched and we nearly capsized. The first night was a quick repair with polyurethane glue while the sun set. Day two was to feature a long, fast broad reach to the lunch spot, and there was no way I was going to miss sailing that stretch! I was repairing until I couldn't see anymore boat...will it work?